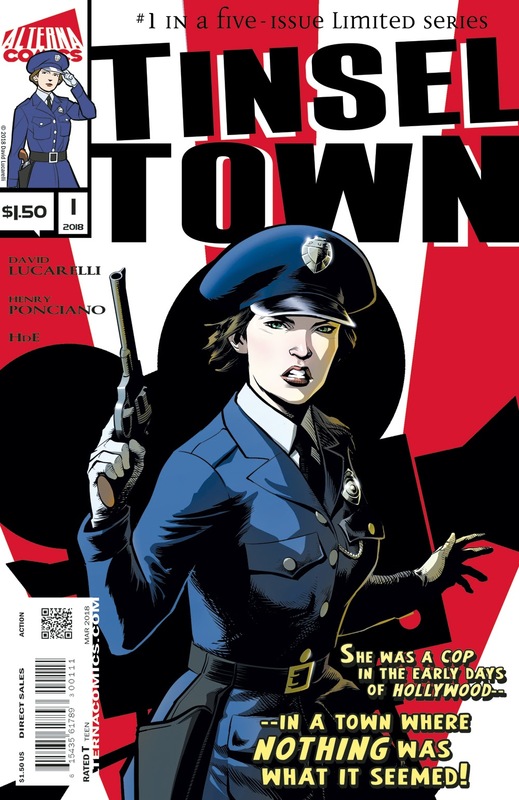 The Fellowship was fortunate enough to obtain a copy of TINSELTOWN #1 from Alterna Comics. The story is written by David Lucarelli; with art by Henry Ponciano, and lettering by HdE. It is 1915, and Abigail Moore wants to be a police officer like her late father. Unfortunately she was doomed to work temp jobs as a secretary. That is until one day she sees an ad about openings for Utopia City Studios. Not realizing these were acting roles, she showed up to apply. She is given the position, but quickly realizes this is not what she was expecting. It gets worse when her first opportunity to serve she has to deal with a famous comedian threatening to jump off a water tower! A nice touch is this book is dedicated to writer David Lucarelli’s mother Miriam who was an officer for the Pittsburgh Police Department. The timing of this issue’s release somewhat mirroring the stories coming from (but not only) Hollywood seems especially relevant. It will be interesting to see Abigail react to this David seamier world she’s entered and she if it is worth it to be what she has dreamed of being…a cop. Not familiar with Henry Ponciano’s work, but liked what I saw: nice, clean straight-forward illustration. This should be another hit in a long line of hits for Alterna. This is a great pick up for anybody who wants to get into comics (but not necessarily with capes and cowls); especially female readers. Check it out. TINSELTOWN #1 is in stores now or available at www.alternacomics.com.